In June 2009, another seminar of the series “Brandenburg for All – barrier free tourism” took place in Potsdam, the capital of Germany’s Federal State of Brandenburg. It was an event like many others before: participants were introduced to theoretical knowledge about the needs of guests with different disabilities, and practical training took place using wheel chairs, crutches, different types of glasses simulating visual impairments as well as ear plugs. Group work, the exchange of experiences and many interesting talks among the participants and lecturers were also on the agenda. Nonetheless, it was a special seminar. 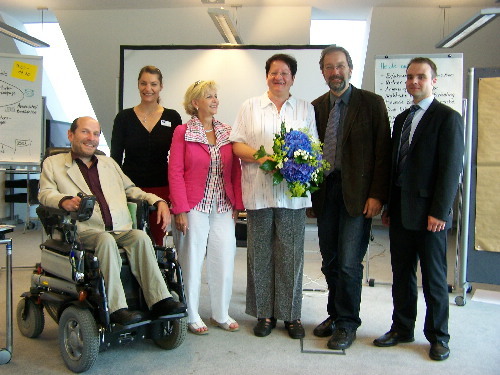 Rainer Kluge, the responsible person of Brandenburg’s government for the interests of disabled citizens, Marlies Thiel, representative of the of Brandenburg’s ministry of economy, representatives of the Potsdam chamber of commerce as well as representatives of the Brandenburg tourism marketing association joined the seminar to honour Christa Buchan as the 100th participant of this new series of seminars organised by the Tourism Academy in Brandenburg since 2008. Rainer Kluger (seated), Marlies Thiel (front-centre-left), Christa Buchan (holding flowers). The Federal State of Brandenburg is one of those German Federal States which have been dealing with the subject “Accessible Tourism for All” for many years. Starting in 1998, tourism organisations in Brandenburg have been increasing their accessible offers for all guests, step by step. Together, they were able to record a lot of progress through various projects in Brandenburg as well as by participation in European projects in the previous eleven years. Especially in Brandenburg’s Ruppin County, Flaeming region and Spreewald area, numerous accommodation and leisure offers are accessible and enjoyable for all. At the beginning of 2008, the responsibility for the subject “accessible tourism” was assigned from the regional tourism association to Brandenburg’s marketing association. Apart from the above mentioned series of seminars for people working in the field of tourism, the improvement of information regarding accessible offers in Brandenburg was begun. New questionnaires for describing the accessibility of tourism offers were developed by involving representatives of tourist organisations and associations for self-help of the disabled. Instead of judging tourism offers as “accessible”, “partly accessible” etc., the on-site situation is described in a standardised way. Reliable information on 132 accommodation, 74 leisure attractions as well as 82 restaurants and cafés has already been checked by trained data collectors and is partially already published at the website Brandenburg without barriers (in German only). Consequently, every visitor with any individual need can make his or her own decision whether this offer meets his or her needs or not. The second key point of this initiative for increasing accessible tourist offers in Brandenburg is the new opportunity for suppliers to develop their knowledge regarding disability, chronic disease and further individual needs by participating in this new series of seminars. They are also informed about suitable ways to make tourist offers and attractions accessible for all. Finally, they hear about best practice in Brandenburg, other parts of Germany and European destinations abroad. “The 100th participant in these new series of seminars is an indication of making good headway” stated Rainer Kluge, to the wide agreement of the participants. Representatives of the marketing organisation declared that they are willing to continue along this path and the representative of Brandenburg’s ministry of economy also confirmed that the government will support this progress as much as possible in the future. Consequently, this seminar and its 100th participant is a proof of the fact that all partners in Brandenburg will continue to work persistently for increasing the number of accessible tourist offers in this Federal state of Germany. Regularly updated news and information about Accessible Tourism in the whole of Germany is available from "Barrier free Tourism Info", a web portal for travellers with additional service needs.